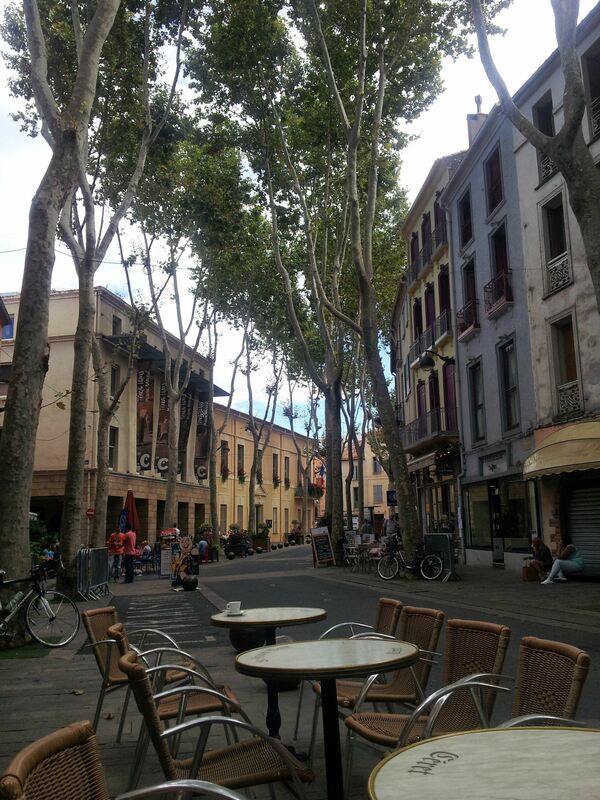 Ceret France ~ What makes it so special? Join us to find out more. Ceret, France. It Takes Me To Another World. Ceret, France. It’s one of my favourite places of all those I have visited. While sitting there under the shade of the trees, enjoying a coffee and watching the world go by, I feel as though I could be living in the past. The pace of life is slow and the ambience calm and soothing. Today, I’ve decided to share an extract from my book which I hope you will enjoy – it is only a teaser because I wouldn’t want to spoil all the fun, would I! For quick reference, Ceret is in the Pyrenees-Orientales and is easy to reach from any of the accommodation along the coast, we visited from Canet Plage where we stayed with Al Fresco Holidays and the drive was pleasant – I could say that about driving in France anywhere but this region deserves to be explored time and time again as it offers everything you could possibly imagine. For me, the fact that we are in Catalan territory makes it all the more special but that’s another article altogether. Here goes with a sample of what is to come! After a couple of dead ends, we decide to retreat down the hill. There must be more than one way into the town surely, and as I creep out of a crazy triangle-shaped junction I catch a glimpse through the trees of some cars parked below the road. If I can find an entrance, this could be a spot to park – it could be someone’s back yard but it’s worth a try. Out of nowhere we see a gap in the trees and turn right down a narrow gravel track. I am a little dubious about this but I really want to see Ceret so I park up next to a couple of work vans and survey the area. It does appear to be a car park and it is actually exactly how I imagined Ceret would be – I can see the old buildings and narrow pathways above us – and though I have yet to find the path to get up to the town, it must be here somewhere. As I release Lola from her seatbelt, I see an elderly couple out of the corner of my eye, emerging from some trees, and I now see the way up to the town. If I am honest, it is so quiet here that I feel like I am intruding. I notice that the couple are carrying a basket and picking fruit, is it theirs or can anyone pick it? I assume the former and although I would love to sample some, my parents taught me better. As we wander up this pathway, I can feel the flutter of butterflies in my tummy. This is what it’s all about – a little trepidation and a town which has been flirting with my dreams for some time. I imagine that the elderly couple I have just seen have walked this same path at the same time every day for fifty years, that the uneven pathway is this way due to the number of feet which have trodden the soft stone over the years; every tiny dent and crack telling a story of its own. This area of France is certainly one with two sides: the orange-brown coloured bodies lying on the beaches or driving their expensive cars, walking the beach in high heels; and those who live a quiet and carefree existence just a few miles inland. Worlds apart. So what do you think? This is an extract from my book “Clancy Goes to France” which is now on sale and continues to raise money for MS. At the end of the book there is a section referencing the routes we took and the places we stayed. I will also add them to this site over time but if you decide the buy the book you’d be helping our efforts to support MS research. If you’d like to receive our newsletter so that you can learn more about what we do, then please click the link below. The newsletter will also keep you up to date with very important things like when I’ve written more about this wonderful spot, Ceret! For the chance to have a limited edition signed copy as well as pre-launch notifications please enter your details.